August in Malta is not the ideal setting for a walk. This did not discourage Gianluca and me from going for a couple of interesting "adventures". Not only was it August in Malta, it was also mid-afternoon and therefore really quite hot. We set off down a flight of steps opposite the Mediterranean Conference Centre and walked on the rocks next to the bastions that make up the perimeter of Fort St Elmo. 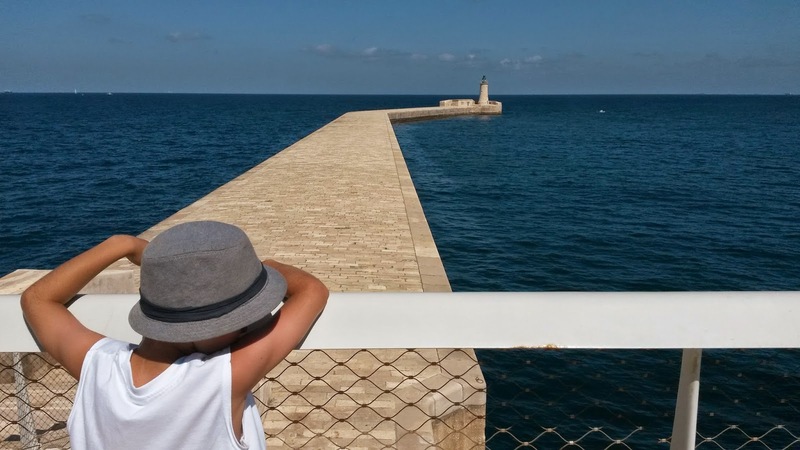 The main breakwater of the Grand Harbour is now connected to the mainland by means of a steel bridge, and that's where we went. Gianluca didn't want to pose for a picture facing the blinding sun, so he turned his back to the camera. The result was one of my best photos ever. 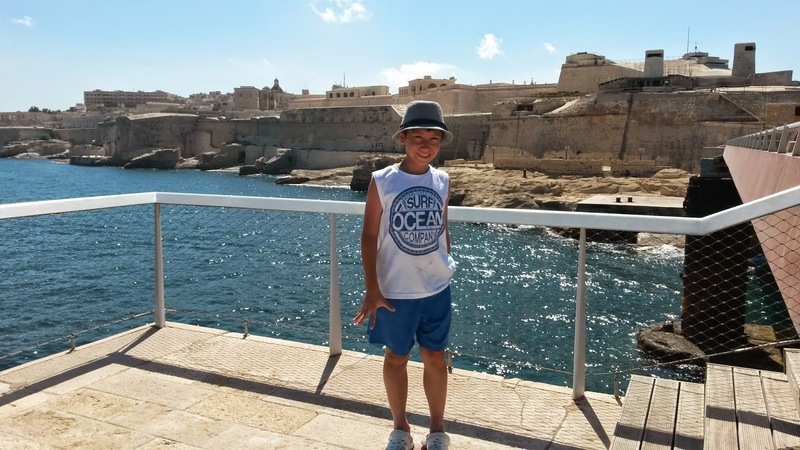 He did accept to face the camera with his back to the sun... and a splendid view of the bastions in the background. Back on terra firma, we proceeded to the other side of the peninsula towards St Elmo Bay, then up a narrow street underneath a tunnel towards the Auberge de Baviere, and back towards the Conference Centre treading very carefully on the pavement to avoid stepping on dog poop. So disgusting. They really should do something about it. The walk ended with a well deserved ice cream / Snickers cake. 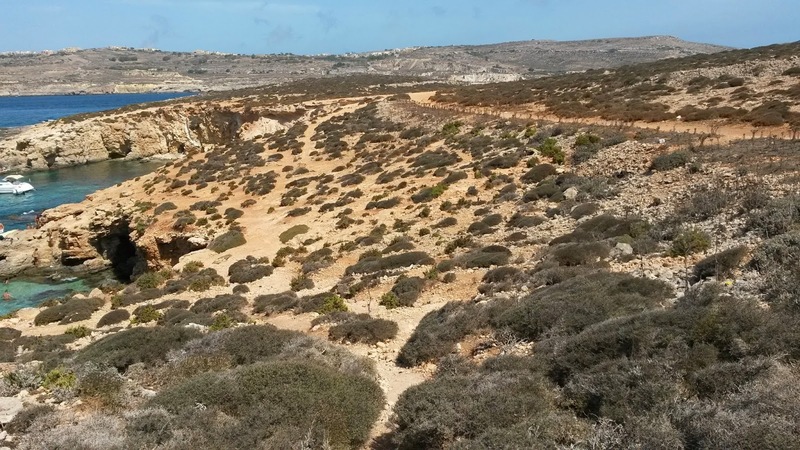 Comino was even hotter. The trip was a hair-raising ride on a speedboat from Spinola Bay. When we got there, before disembarking, we were shown some interesting features, including a cave with shimmering turquoise water as well as a sunken patrol boat, now an attraction for divers, which was just visible from the surface. The Blue Lagoon is where hundreds of day trippers spend their day on deckchairs underneath umbrellas, completely clogging up the place. It was really, really, crowded. Our guide Ian who drove the boat had mentioned that Santa Maria Bay was a 20 to 30 minute walk away, so Gianluca and I immediately decided to escape the mayhem and seek more tranquil surroundings. Did I mention that it was hot? 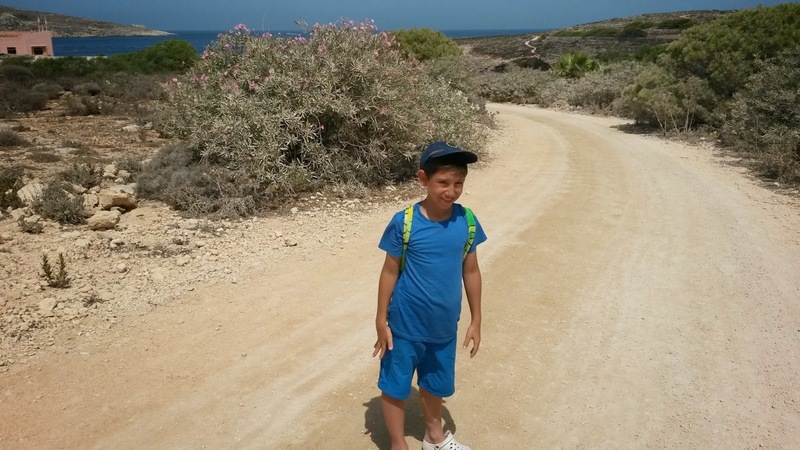 At one stage Gianluca pointed the correct way to the hotel, which was an intermediate stage to our destination. We met a group of Gozitans, who where heading to the Bajja ta' Santa Marija, and we chatted and walked with them for a while. Finally, the bay came into view. It was also rather crowded, but much less than the Blue Lagoon. We found a shaded spot on the sand, under a tree, had a sip drink of bottled water, and jumped into the sea to cool down. The walk back from Santa Maria Bay was even hotter, characterised, among others, by a stop at the Comino Hotel for a fish and chips, a Blue Label beer and a Coke, a towel on top of my head while I was walking, as I had forgotten to bring a cap, but most of all, that most characteristic sound that says "the peak of summer in the Mediterranean". The continuous loud screech of cicadas. Gianluca actually spotted one sitting on a dried up plant and showed it to me. We went up close and the sound stopped. 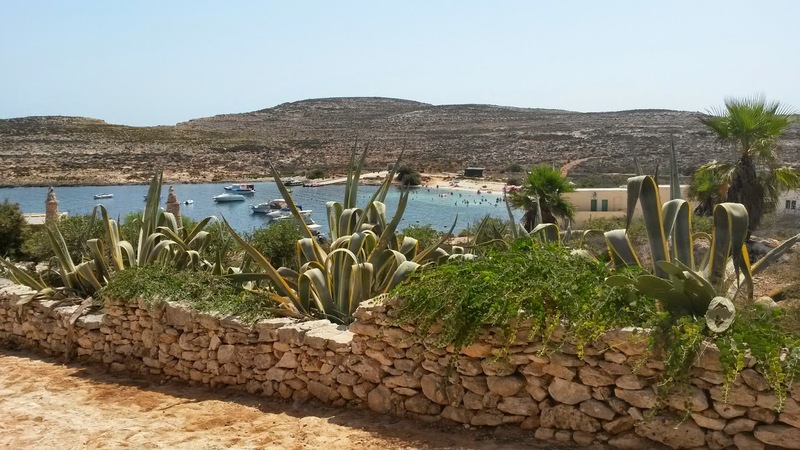 Eventually, we jumped into the melee at the Blue Lagoon to rejoin our group, swam over to Kemmunett and back with Gianluca's mama, and waited for the boat, driven by our dreadlocked guide Ian, that raised our hair even more than in the morning as we speeded back to Spinola Bay. Did I mention that it was a tremendously enjoyable day?